Brophy Timber Services Ltd is a family-run business which specialises in timber harvesting and extraction. 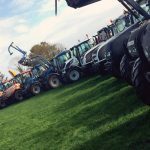 Irish Tractor & Agri heard more recently from Damien Brophy about the company which employs 19 staff from its base in Mountrath, Co Laois. Business is good right now at Brophy Timber Services Ltd and Managing Director Damien Brophy is intent on keeping it that way. 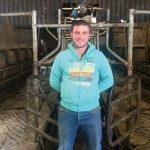 Based in Mountrath, Co Laois, the company is celebrating a decade in existence this year and the plan for Damien and Co is to continue growing the business the way it has been over the past 10 years. 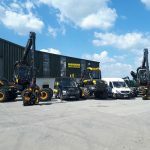 Brophy Timber Services Ltd specialises in the harvesting and extraction of both thinnings and clearfells, while also providing its clients a timber purchasing service. Damien has been immersed in the company since he was 26 years old and, alongside his father, they have worked hard to develop the business during the past decade. The man himself explained all about what is very much a family business these days. “We have 19 staff working here and it’s a family-run company with my father and brother also still here,” Damien outlined. The main forms of harvesting undertaken in Irish forests are thinning and clearfelling. Thinning removes a portion of inferior trees, increases the quality and size of those remaining and may be carried out three to four times in conifer plantations. Clearfelling is carried out at the end of the rotation, usually between age 23 and 45 in Sitka spruce forests. Being situated in Mountrath, Co Laois means that BTS can provide its service to any part of the country, with the company’s main customers being Coillte, Griffith Timber Products Ltd, Murray Timber, Coolrain Sawmills, McHugh Timber, ECC and Curran Sawmills. “We do a lot of work with Colite and get a lot of repeat business off them,” Damien explained. 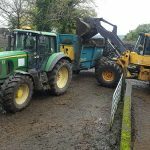 “We work for Coolrain Sawmills, ECC in Galway and Curran Sawmills in Galway. We supply a lot of timber to those sawmills and at the moment we’re doing a little bit more in biomass. 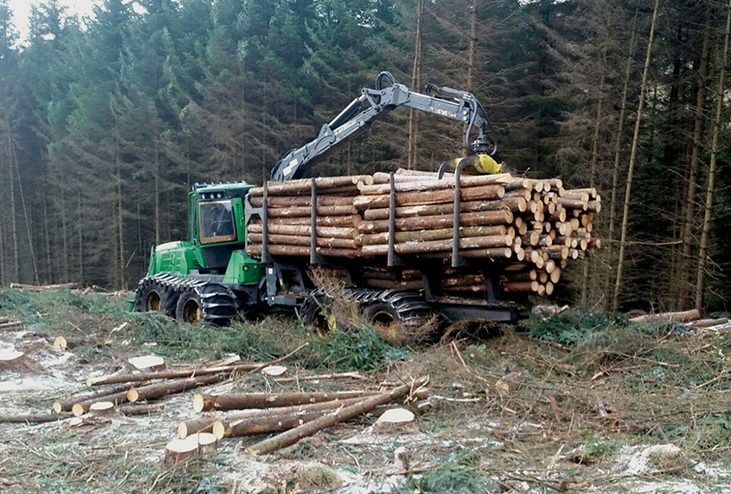 Nowadays the majority of timber harvesting is carried out using specialised harvesting heads, either fitted to standard excavators or on purpose-built ‘harvesters’. 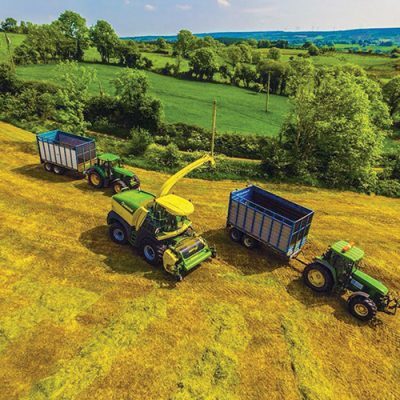 With costs up to €460,000 for new machines, harvesting contractors will only be attracted to areas where sizeable harvesting volumes are available and will seek to minimise stoppages and downtime. Co-ordination of harvesting operations between forest owners makes good economic sense. There are plenty of rules and regulations to adhere too in timber harvesting, all of which Brophy Timber Services Ltd comply with as the company’s staff are highly trained, according to Damien. 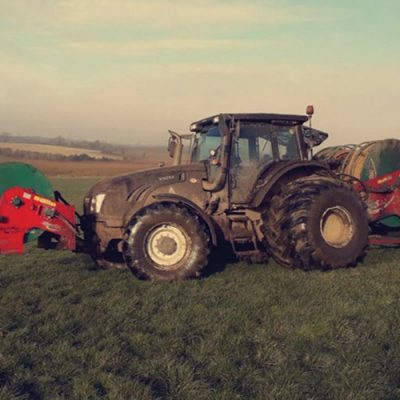 Due to the considerable level of farm forestry planted in Ireland since the mid-1980s, the need for appropriate harvesting systems is very apparent. Large scale technologies will not suit all situations. Machines developed in other countries may only have limited applications under testing Irish site conditions. 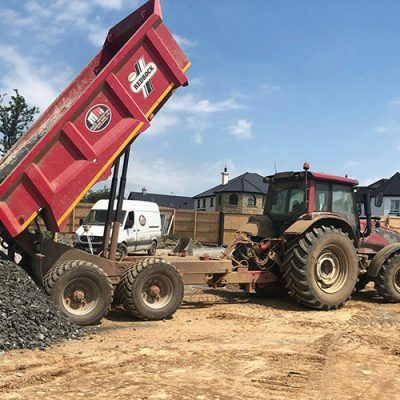 “We can contract in the type of haulage needed to transport our machinery and the timber in and out of areas that would have poor roads or maybe no roads at all. I work with a number of haulage contractors including Lawlor Transport,” Damien outlined. As for the machines which BTS operates with, the Managing Director explained that Ponsse and John Deere are largely the brand of choice. “We have a lot of their gear here and John Deere Forestry in Wicklow and Ponsse in Portlaoise are who we deal with. We’ve moved towards the eight-wheeler machines with them again as we find them excellent and reliable,” he stated. It seems that many of the company’s customers share the same view when it comes to the service BTS provides. The way Damien sees it, the secret to success is very much down to offering clients a quality service. “Good work comes at a price and we do very good work here. We do an awful lot of work that others can’t with the equipment that we have here and we do an awful lot of the engineering ourselves,” he said. “There isn’t a site in Ireland that we couldn’t cut timber on. Our biggest issue would be getting top quality saw men. My father is 62 now and he’s still one of our top saw men here. It is hard to get young people to take over on the manual labour side of things. As mentioned BTS offer a standing timber purchase service that sees Damien going to forestry sites and buying specialised timber for his customers. It’s safe to say, Brophy Timber Services is willing to go the distance when it comes to its clients’ needs.